← GREAT SCOTT! “Marty McFly Must Die!” flash fiction story – Last day to vote! 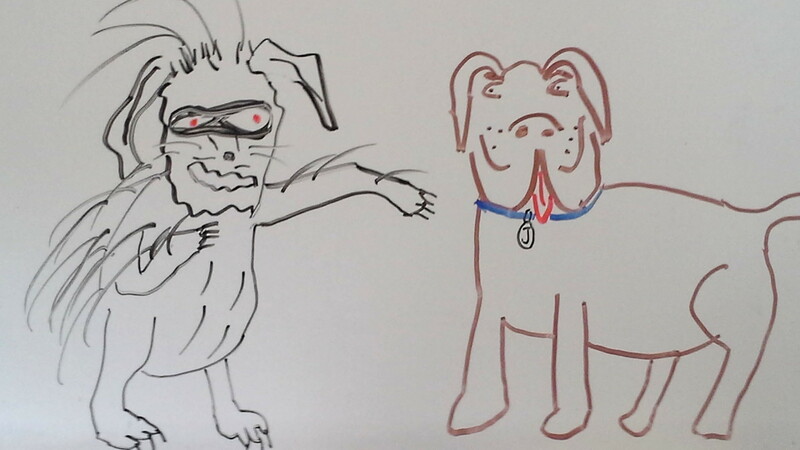 A pukwudgie, a mean-spirited paranormal forest creature, menaces Larry’s hound Jimmy. In 2011, the year after I wrote Blue Spirit, I was at my critique group meeting, helping in a brainstorming session about paranormal legends told in Indiana. “What about pukwudgies?” I said. Everyone stared at me. I went on to explain that in my previous life as a paranormal investigation hobbyist, I’d heard stories about “hobbits” or “little people” up in Mounds State Park. Native Americans named them Pukwudgies, and though they’re more often talked about in New England, Mounds is supposed to be a “hotspot of Pukwudgie activity”. I had the table’s attention, and I was encouraged by my friend Sara to write a story about the Pukwudgies. I resolved to make them central to the sequel to Blue Spirit, which I decided would be “Mean Things” using another Blues lyric from Bessie Smith. I changed my mind later, to go with the “Spirit” theme, and it was to be called “Mean Spirit”. I started to write it, but only ever managed 4-5 chapters’ worth. When November and NaNoWriMo rolled around, I was seized by a new idea, which became Reality Check. The following November 2012, Reality Check had been revised and edited and I’d found a home for it as my first publisher-published novel with Hydra Publications, so I was busy working with one of their editors to get it polished and ready to go. So, I didn’t do a novel that year. In 2013, I’d had another idea: Mean Spirit starts off with Skye in rehab. I thought to myself, “Skye needs to have a book where she’s even wilder and takes things too far before we get to rehab.” That, and some ideas from R.J. Sullivan’s use of Skye in his Virtual Blue, plus setting it at Gen Con Big Con, with trolls, made that my passion for NaNo that year. It’s called Restless Spirit, and it is next in line to be published by Seventh Star Press. Now I have poor Mean Spirit still waiting in the wings, abandoned more than once due to shinier projects. And it isn’t a cinch to be my project THIS November, either. I have this other science fiction story nagging at me… But I have had some big ideas for Mean Spirit come along in the past few months that are also vying for my attention, so we’ll see, I guess. Oh, and here’s a treat for you, if you’ve made it this far: Pukwudgie vs Cthulhu! This entry was posted in Blog, Fun Stuff, Hydra Publications, Seventh Star Press and tagged amwriting, blue spirit, Mean Spirit, NaNoWriMo, paranormal, pukwudgies, restless spirit, tipsy fairy tales. Bookmark the permalink.